"You see things in terms of words. I see them in terms of light and shadow, and in between there is mystery." Ary Stillman (1891 –1967) was a Russian American artist who, in spite of gaining recognition in his day, is missing from the annals of art history. Yet the works he produced have stood the test of time and offer contemporary audiences new perspectives on the prevailing styles and influences of the past. Following his own independent and wayward course moving from representational art to the post war, painterly style of abstract art inspired by cubism and surrealism, Stillman took cues from his surroundings — be it Paris in the ’20s, New York in the ’30s, ’40s, and ’50s, or Mexico in the ’60s — and, while absorbing the stylistic innovations of these decades, translated them through his own particular vision to arrive ultimately at a unique, mature body of work. In tracing the evolution of Stillman’s art, one finds evidence of his early academic training in Russia, the lingering spell of Impressionism in Europe in the early part of the twentieth century, and the mid-century impact of Abstract Expressionism in America. However, in examining his work , one discovers another story — the story of a young Jewish boy in Russia seeking to fulfill his dream of becoming an artist against all odds. In the course of his lifetime, Stillman overcame poverty, political turmoil, and failing health to pursue that goal. His legacy is not only the more than 1500 works that he left behind, but also the inspirational example of his life. In 1907 Ary Stillman immigrated from czarist Russia to Sioux City, Iowa, where he spent his days working to support his family and his nights painting. All the while he hoped to continue his artistic training. In 1919 he succeeded in moving to New York, and then, two years later, to Paris to further his studies. He soon earned a reputation on both sides of the Atlantic for his atmospheric landscapes, as well as his elegant portraits of women. 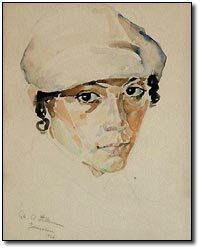 Traveling to North Africa and Palestine, Stillman also created watercolor portraits of individuals from various cultures. Although Stillman was certainly exposed to abstract art as well as the beginnings of the surrealist movement in Paris, he did not immediately embrace these new ideas, responding instead to the impressionists’ experiments with light and atmosphere. In 1933 Stillman returned to New York. There, he painted the familiar landmarks of the city, capturing the vibrant crowds and the cadence of urban life. 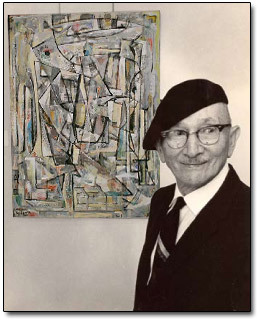 He worked for the easel division of the WPA Federal Art Project and became a member of the American Artists’ Congress. He participated in numerous exhibitions, and his art was well received by the public and the press. 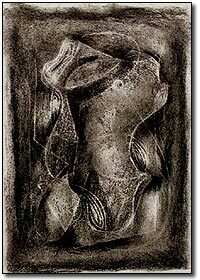 Stillman particularly responded to the Abstract Expressionist pursuit of the universal language of archetypal forms and symbols, which psychiatrist Karl Jung and anthropologist Joseph Campbell believed modern man inherited from our prehistoric ancestors. Because these “memories” exist deep within the subconscious, to excavate these buried images artists employed the techniques of psychic automatism, subverting conscious control through spontaneous actions. During the summer of 1948 in the Cape Cod Massachusetts artists’ colony of Provincetown, Stillman’s experiments with such techniques led to a unique drawing process. Using an inkless pen, or some such tool, the artist impressed the paper with invisible scribbles, which only emerged as white lines when he rubbed a flat stick of charcoal or pastel across the surface. These evocative, subtly modulated, works on paper are sophisticated, yet little known, examples of Abstract Expressionist art. He imbued his abstractions with a glowing atmospheric quality that derives from both impressionism and the Old Testament concept of divine light. He subsequently adapted this technique to the graphic arts, experimenting in the early 1950s with color lithography and woodcut. During the rise of the New York School, Stillman exhibited regularly at the Bertha Schaefer Gallery on Manhattan’s 57th Street and with the Provincetown Art Association. Yet, Stillman severed these affiliations when he moved to Mexico, in 1957. In failing health, he spent the final ten years of his life between Cuernavaca and Houston, Texas, where he received medical treatment In many ways Stillman’s paintings and works on paper from this period constitute an inventory of life experiences that apply techniques of gestural abstraction, surrealism, and impressionism to imagery derived from myriad sources including precolumbian Mexican culture, classical mythology, literature, history, and his own personal memories and dreams. A gift of 90 paintings and drawings will position Columbia University as the most significant repository of the work of Ary Stillman (1891-1967), a mid-20th-century artist affiliated with the New York School of abstract expressionists. The recent donation from the Stillman-Lack Foundation also includes $800,000 to establish an endowed fellowship fund for PhD candidates in modern art in Columbia's Department of Art History and Archaeology.